As internet users, we are all exposed to a number of YouTube advertisements every time we are connected, unless we blocked them. During my time in India, I witnessed a few interesting online videomercials that were designed to be geographically-targeted. In India, it does not require watching more than one or two ad campaigns to understand that the media exclusively employs light skinned actors. However, a commercial for a so-called anti-pollution cream especially got my attention. Knowing that pollution is a tremendous issue in India and often seeing women in Pondicherry, putting a scarf around their head to protect their faces in traffic, I was intrigued from the start. In the video, a young light-skinned female plays a typical Indian woman washing her face with the product after realizing that a scarf does not protect her skin “against dullness caused by pollution particles”. The face wash promises to “extract all pollutants from the inside” and yield a “glow and fairness on the outside”, owing to its activated carbon “that has purifying power”. I was completely confused as soon as I heard the advertisement and saw what was written on the packaging: “Pond’s pure white face wash.” However, what really shocked me was at the end, when I saw Unilever’s logo. Pond’s is a brand of beauty and health care products owned by Unilever, world’s third-largest consumer goods company. When I visited Pond’s website, their brand philosophy expressed how each product brought out the best in women’s skin that was linked to its fairness. Valuing fair skin can carry two definitions: fairness either implies beauty and physical attractiveness, or suggests being light in color, meaning a skin of light complexion. Here the direct association made between beauty and light skin is patently clear, furthermore, the idea of a whiter skin connected with “purity”. This “purifying power” is what Pond’s promises to provide to their customers. The “purity” again seems to hold a dual denotation here: it does not only indicate being hygienically-clean, but it also qualifies being of unmixed ancestry or origin. Pond’s does not solely rely on rhetorical techniques to persuade women in buying their products but carefully exploits and accentuates discrimination of skin color, on the pretext of offering a solution to avoid pollution effects. In a country like India, where both race and caste underlie extreme inequalities and prejudices that are based on birth, Unilever commercializes these deeply-entrenched social stigmas to peddle skin-whitening products for profit. After further research into their advertisement campaigns, I encountered no shortage of more disturbing content. The Anglo-Dutch corporation offers a prescription for those who have dark skin: buying Pond’s products makes you whiter, more desirable, and even helps you find love. The Advertising Standards Council in India published certain guidelines in May 2014, concerning skin lightening and fairness improvement products. Communicating discrimination of skin color through advertisement, using post-production visual effects to enlighten the skin of the model or associating the darkness or the lightness of the skin color with a socio-economic strata were articulated as a major concern for the sector. As a matter of fact, Pond’s advertisement campaigns seem to have gotten less negligent of these issues through the years, if not completely ethical, nor sensitive about the matter. 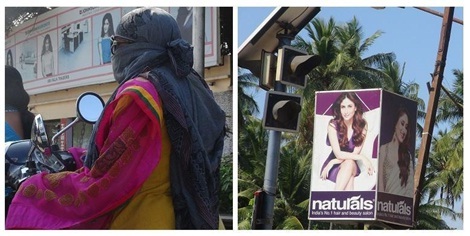 Click to see difference between a recent campaign (2014) and an old campaign (2008). The more I discovered different advertisement campaigns, the more my ears got used to hearing the slogan: “Pond’s – White Beauty”. 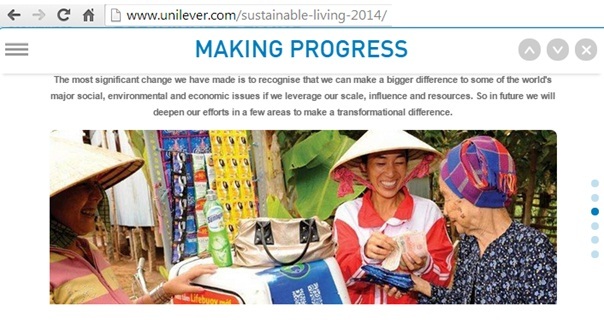 If Unilever wants to invest in creating a positive social impact in the countries where they sell their products, they should have undertaken the responsibility by changing their brand’s message before they dedicated a whole section of “Sustainable Living” on their website. This entry was posted in Uncategorized and tagged development, Discrimination, India, Ponds, Skin, Sustainability, Unilever by aupindia. Bookmark the permalink.